Gold Cart Pop-Ups Go for a Different Kind of Menu in Richmond | Food and Drink | Style Weekly - Richmond, VA local news, arts, and events. 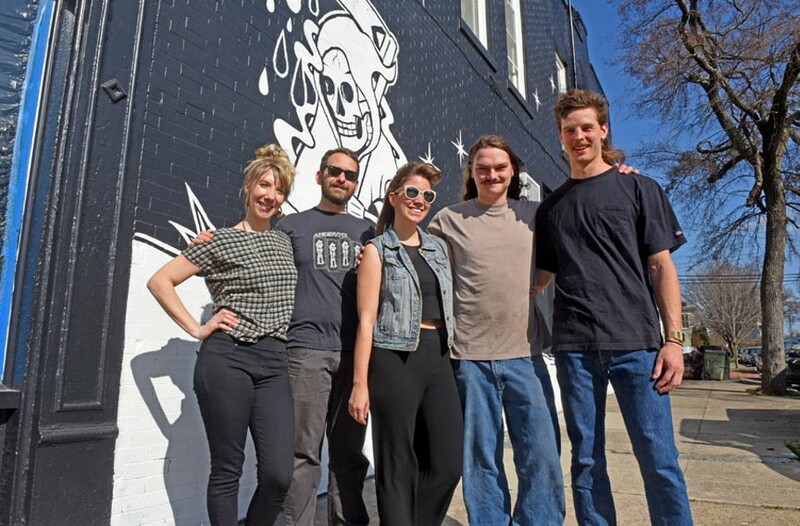 Scott Elmquist Liz Rosenberg, Erik Heffernan, Andrea Singer, Will Rigsby and Ned Curry are the culinary team behind Richmond’s latest pop-up, Gold Cart. They plan to transport diners to a winter lodge in Quebec at Comfort at the end of the month. There was a time when pop-ups seemed to spring up everywhere. The pace hasn’t exactly ground to a halt, but unusual one-offs are less frequent than they used to be. That doesn’t mean the trend is going the way of fondue and food blogs. Ned Curry, Erik Heffernan, Andrea Singer and Will Rigsby are moonlighting from day jobs at Pasture, Comfort and Citizen to create a different kind of menu for a series of pop-ups called Gold Cart. The first, held at Citizen in December, featured $5 plates of Latin American street food, Black Label beer for $1 and walk-up counter service. There were no reservations. Customers grabbed seats, looked at the menu, placed orders at the counter and were handed numbers. When they were called, they grabbed their plates at the kitchen window — and there was dinner. Gold Cart kept its prices low so that it could do a little experimenting to gauge the pop-up’s reception, Curry says: “We went into it thinking [that] if we didn’t lose a lot of money it wouldn’t be too bad.” Instead, Gold Cart made money. And that success inspired the team to do another dinner, with the goal of making it a regular series. The prices will go up — but not by much. Plates will be $8 this time around, with cocktails for $5. The four will also veer north for menu inspiration. When Curry, Heffernan and I talk at Saison Market, it’s an unseasonably warm day with temperatures in the low 70s. “We were assuming it would actually be winter this year,” says Heffernan, a Boston native. A vegan poutine made with cashew cheese, a venison meat pie and a ham hock ragout will be a few of the menu’s strapping choices. There still might be time for a few cold days to go with the food. The next event will be held at Comfort on Sunday, Feb. 26. The team plans to cover the inside of the restaurant with its own signs, vintage skis, taxidermy and snowshoes — anything to give it that winter vibe. “It’s to try to create a different experience,” he says. That’s Gold Cart’s mission in a nutshell. “There is a market for these new cuisines,” Curry says. Pop-ups are a low-risk way for diners to tiptoe out of their comfort zone. “There’s a demand for a different kind of service,” Heffernan adds. The walk-up counter and communal tables create more of a party vibe, they say, because people are forced to move around. Will this pop-up lead to bigger things? CORRECTION: This article originally listed the date of the event incorrectly. It will take place on Sunday, Feb. 26.